Our home was built in 1935. The kitchen isn't large, but no one goes hungry around here! ;-) The first photo is of the north wall. All kinds of plant cuttings, especially from herbs, can be found in the windows on any given day. The shelf above the sink was added with this remodel. It's nice to have a little more shelf space as there is not a lot of cabinet storage. These photos were taken about 27 seconds before we hosted a baby shower. Our kitchen is seldom this tidy. There's usually some kind of creative explosion in progress, as we both like to cook. I'd like to point out the wire peg "shelves" inside the windows. These are actually the racks from our old dishwasher. When we were smack in the middle of painting, our dishwasher died. Handsome Husband was working on switching to a new one and had placed the racks in the middle of the kitchen floor. When I kept tripping on them, I shoved them into the window in complete exasperation just to get them out of the way. Well, they stayed long enough to catch a tool here and there and then some other items. I really like having that bit of storage that still allows us to see out the windows. The dishwasher racks are currently suspended with tension rods. One of the selling points of our home is this table that folds down from the wall. Normally a couple of wooden chairs are tucked at the front. 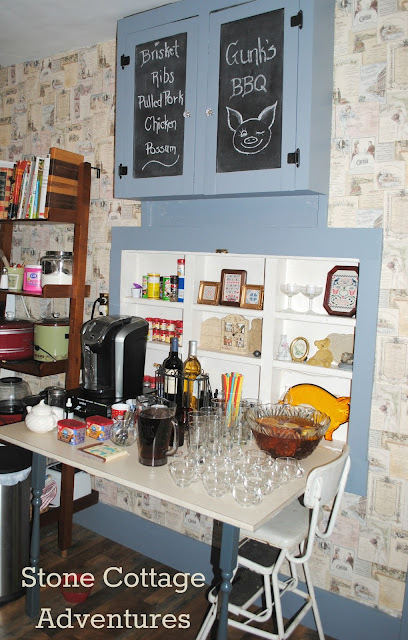 I've had such a good time with that bit of chalkboard paint on these cabinet doors. There's a funny space between the table and cabinets that is currently gray. I'll probably turn that into a small chalkboard, too. The little cubbies behind the table are filled mostly with sentimental items, like the stemmed glasses from our wedding. All the cross stitch pieces are mine. One side makes a handy spice rack. The shelf between the table and stove catches cookbooks and small appliances. Looking into the dining room, you get a pretty good view of the wallpaper. It's a collage of vintage-looking menus. My paint is actually a medium gray, but looks more blue in these photos. The light fixture came with the house. Our refrigerator sits inside its own little closet. This can be challenging though, as the size of refrigerators today are different from the early to mid 1900's. ;-) We have to measure carefully before making a purchase. One last look back... I love having "Thank You" notes and grandbaby paraphernalia all over the fridge. Would you like a cup of coffee or a glass of sweet tea? Marci that fold down table is so practical and pretty. I also like your chalkboard cabinet doors. Your kitchen is so pretty and comforting. What wonderful memories it holds! You have such a lovely kitchen! One of my smallest kitchens was the most efficient because I made every inch count. :) I'm sure that lots of wonderful things come from your kitchen! I love the blue and white! plus the wallpaper is cool! 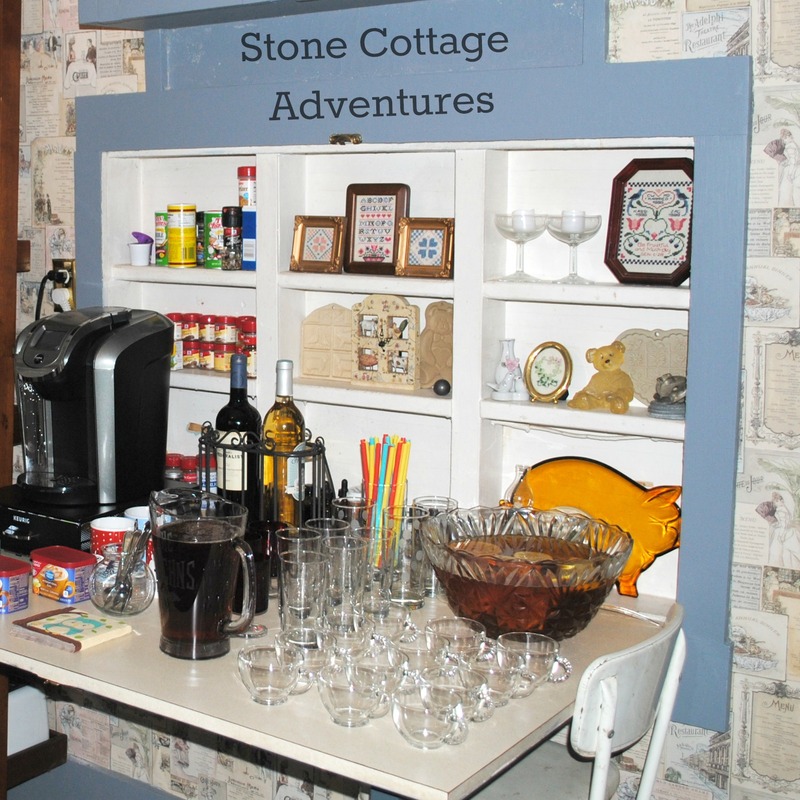 Love the little cubbies behind the table! This reminds me of my parents' last house. My Daddy built furniture and built ins to make use of every inch of space. You gave me an idea to write a post on a little desk he made that I still have. Vintage home have so much style. I like the cubby holes and especially the shelf above the sink. Blue and white have always been my favorites for kitchens. I'll have tea please. 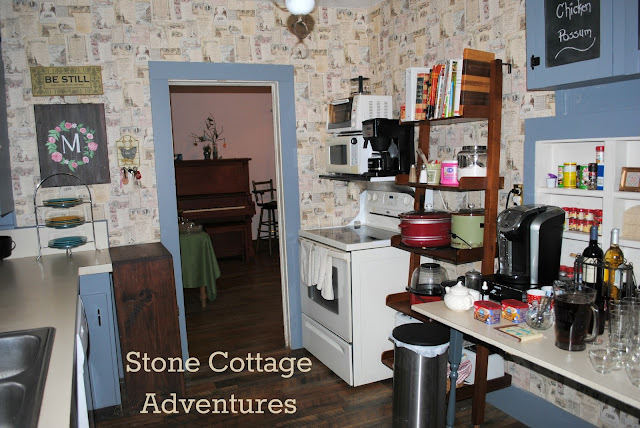 Your kitchen is adorable...so much character & features in the older homes you don't see today, like that fold-down cabinet out of the wall. Sort of like a Murphy bed cabinet. Like your wallpaper too. We used to live in a 1930's house. I loved it, but downsides were small closets! Funny you are using dishwasher baskets in your window. That struck a chord. We are using a dishwasher utensil basket in our motorhome as a catchall for things like hairbrushes, combs, & other taller items. I love to have a place for everything to reduce clutter. What a cute kitchen. Our last house was built in 1935 and had a very similar kitchen and our refrigerator was also in a cubby. So strange! Thanks for the tour! Love the country look of your kitchen, the color is dreamy! its one of my favorite color blue. What a unique and lovable kitchen, such charm! I love wallpaper and would love to see those vintage menus up close. Looks like you have loved it well. Thank for sharing you space. I love your cabinet color. Your kitchen is darling! I love all the personal touches you added to it! I love your kitchen, you have fixed it up perfect including the cute curtain on the door. But the dishwasher shelves are an outstanding idea, great re-purpose idea!!! Thank you for sharing on the #OMHGFF this week. Have a great weekend! What a sweet kitchen!! I love the dishwasher rack idea! Tea for me, please. I'll bring the pie! Your kitchen is so charming. I like it ever so much more than a big, slick, trendy kitchen. A cup of coffee please and I enjoyed your kitchen tour. The rack shelves in the window and the pull down table are very unique. Thank you for sharing with us this week at Celebrate Your Story and we hope you will join us again next week. I always love to get a peek into someone else's kitchen. I love the way you have used the space efficiently to create an airy, organized kitchen that works for your needs. Thank you for sharing it with us at the Healthy Happy Green and Natural Party Blog Hop. I'm pinning and sharing. I, too, have a small kitchen. I look at magazine pictures of "designer kitchens" with a little envy sometimes but then I get over it and cook supper without having to walk a mile in a huge kitchen. I prefer my mile walking to be done outside in the fresh air. 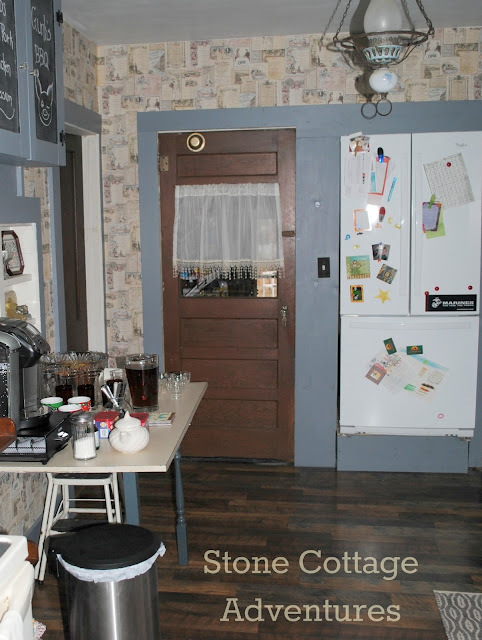 I love the character of your kitchen! It is so cute! 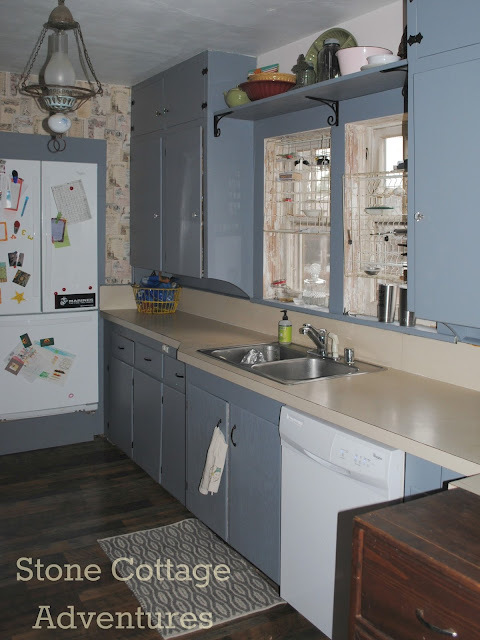 I painted my kitchen cabinets once (in a different house) a periwinkle blue and I loved it! Your kitchen is so very cute. Small but very functional, fun and so cute! !